Laser Lights Cosmetic Laser Center and Southern Plastic Surgery, PC now offer SculpSure™ non-invasive fat reduction, the latest and most advanced fat reduction technology available for maximized results in half the time. Before & After SculpSure Treatment. Patient photo provided by manufacturer. One of the most notable benefits of SculpSure™’s advanced technology is that treatments can be completed in half the time of existing fat reduction methods. Since 1999, Laser Lights Cosmetic Laser Center has been a leading provider of cosmetic laser treatments, from laser hair removal and other laser treatments to facial rejuvenation and much more. To continue to provide Atlanta-area residents with the best aesthetic results available, they are pleased to announce the addition of SculpSure™ non-surgical fat reduction, the newest and most advanced technology available today for targeting excess fat without surgical liposuction. While earlier fat reduction methods have used cooling and ultrasound energy, SculpSure™ is the first to use light-based technology. Through customized plates, a precise wavelength of light is used to damage fat cells while leaving skin and other tissue unharmed. Results continue to improve for approximately twelve weeks after the treatment as the body’s natural processes remove the damaged fat cells, reducing the unwanted fat in the area by up to 24%. “One of the most notable benefits of SculpSure™’s advanced technology is that treatments can be completed in half the time of existing fat reduction methods,” says board-certified plastic surgeon David M. Whiteman, MD, owner of Laser Lights Cosmetic Laser Center and Southern Plastic Surgery, PC. While previous procedures took approximately an hour per area, SculpSure™ can achieve more successful results with just one 25-minute session. SculpSure™’s advanced technology opens the door for a wider variety of patients to address specific areas of diet and exercise-resistant fat. “Older technologies were often time-prohibitive and cost-prohibitive, so even if a patient would have been a perfect candidate for the procedure, they didn’t have the opportunity to experience the results,” explains Dr. Whiteman. 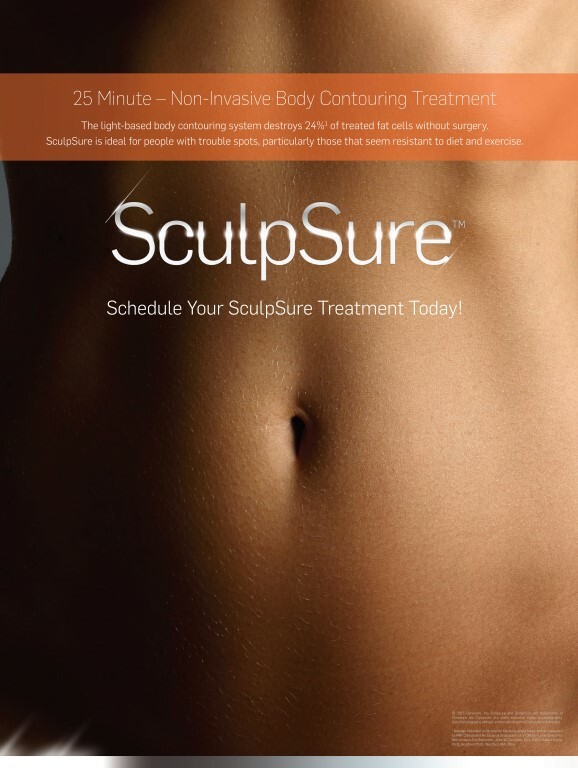 “With SculpSure™, not only are these patients now able to benefit from fat reduction, they can get even better and faster results than the outdated methods offered.” Although it uses a light-based method like lasers do, this technology is FDA-cleared and safe for all skin types, and because no downtime is required and the treatments are brief, it is convenient enough to be accessible to even those with busy schedules. Staying at the forefront of the latest technology is crucial for the aesthetic industry, allowing patients to take advantage of the safest and most effective cosmetic treatments available, administered by our experienced, trained, and licensed professionals. SculpSure™ non-surgical fat reduction is a further step in this effort to help more patients achieve an appearance they feel confident in, regardless of whether they are candidates for plastic surgery or non-surgical treatments. Laser Lights Cosmetic Laser Center offers this and a wide variety of other laser and non-laser aesthetic services at the 4300 Pleasant Hill Road, Duluth office. To learn more about SculpSure™ fat reduction and other available Laser Lights treatments, call (770) 495-9322 to schedule a complimentary consultation. Laser Lights Cosmetic Laser Center has been dedicated to raising the self-confidence of its patients through various laser treatments and facial options for over 15 years, including nearly ten years with double board-certified plastic surgeon David M. Whiteman, MD, FRCS(c). With over a dozen unique lasers for every skin type as well as a wide variety of non-laser skin treatments and some of the most advanced aesthetic technology available, Laser Lights can match each patient with the ideal procedures to meet their needs. Their list of services includes, but is not limited to: laser treatments for hair, tattoo and wrinkle removal, as well as non-laser treatments for the face and body. Gift certificates are also available, allowing your loved ones to select the perfect treatments for them.